Looking for a great country setting just a few minutes from town? 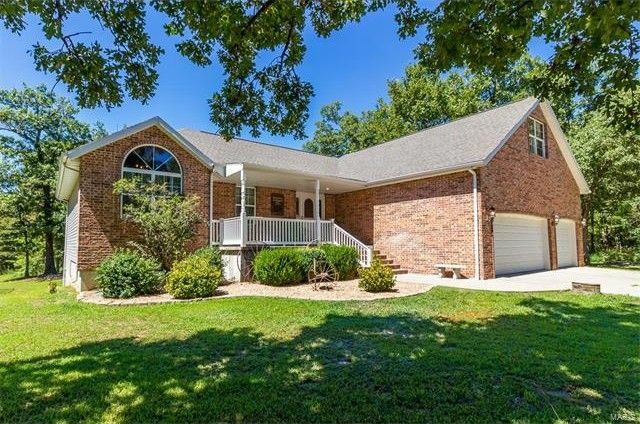 This home is tucked away on 3 mostly wooded acres giving you the privacy you crave! With over 4,200 sq ft including 5 bed/3 bath & a full finished walk-out basement, there is SO MUCH SPACE! The entry foyer & living room has great hardwood floors, wood-burning fireplace, & vaulted ceilings. The kitchen/dining has the same lovely hardwood floors, vaulted ceilings, tons of custom Birch cabinets, & all SS appliances including a BRAND NEW fridge. A large master suite w/ whirlpool & separate shower, double sinks, & a large walk-in closet. Bonus room on upper level could be a 4th bedroom, playroom, or office. The finished basement has 9' finished ceilings, wet bar, 5th bedroom, full bath, & large family/rec room. An amazing deck & pool were just installed in Summer 2016 & are ready for you to enjoy! With fresh paint throughout, this one-owner, well-cared-for home is THE ONE you don't want to miss! Directions: N Hwy. 5 to Hwy. YY, in approx. 3.5 miles turn right on Harrill Lane. House is the 2nd home on the right. Look for sign.